This lithograph is taken from plate 22 of Emily Eden's 'Portraits of the Princes and People of India'. Eden wrote: "These persons with their strongly marked Tartar features, long rough hair, loose coarse dresses, are peasants or petty traders, from the plains of Tibet, north of the Himalaya range, who descend by the snowy passes during the summer, to the lower hills, and barter their long-haired Tibetan goats, and some other rude produce, for articles of necessary use and consumption, cloths, salt, grain etc. This group was sketched from a party who visited Simla while the Governor-General lived there." 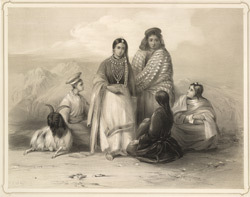 When Lord Auckland and his sisters travelled north from Calcutta, they stayed in Simla for long periods.